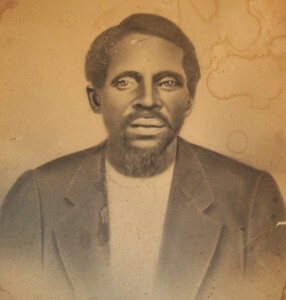 The African American Cemetery on Wessyngton Plantation was founded by Joseph Washington who came to Robertson County, Tennessee from Southampton County, Virginia in 1796. Joseph later returned to Virginia and brought African and African American slaves with him. The cemetery was used by the enslaved African American population of the plantation and their descendants from 1796 to 1928. In 1995 a memorial monument at the African American Cemetery was erected by Mary Washington Holley, Thomas Blagden and Preston Frazer, direct descendants of Wessyngton’s founder Joseph Washington. It honors those buried there. In 2012 a beautiful six-foot aluminum fence was erected to enclose and protect the cemetery. The fence adds charm and dignity to the cemetery. Special thanks go to Stanley Frazer Rose, a sixth generation descendant of Joseph Washington, for his generosity in funding this renovation. The African American cemetery is located some distance from the Wessyngton mansion on a hill overlooking Caleb’s Creek. This is near where Joseph and his slaves first settled in 1796. The cemetery measures approximately 640 square feet and contains an estimated 200 graves. A geophysical survey using ground penetrating radar is planned to determine the actual number of graves in the cemetery. At that time, the original monument will be enlarged to honor all those who were buried in the cemetery. This monument will be funded in part by Mary Hotchkiss Gregg, Robina Gregg O’Rourke, Robert Etheridge Gregg, and Robert Hunnewell Gregg, sixth generation descendants of Joseph Washington. Recently while going through some old photographs, I ran across this one taken with childhood friends Wanda Gardner, Drextel Bowling, Teresa Gardner, Charles Gardner and Kim Bradley. 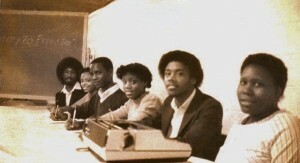 The photo was taken in 1981 at Greater South Baptist Church during a Black history lesson. I was quite surprised when I noticed the blackboard behind me had part of the subtitle to my book Journey to Freedom in the background nearly thirty years before the book was published. My publishers at Atria Books, a Division of Simon & Schuster selected the subtitle for The Washingtons of Wessyngton Plantation. On May 3rd, I had the honor of giving a presentation on The Washingtons of Wessyngton Plantation to the Austin Peay Women’s Book Club in Clarksville, Tennessee. To my surprise, one of the book club members presented me with a photo of Washington Hall taken in 1965 a few months before it burned. George Augustine Washington Jr. and his wife Marina “Queenie” Woods, began construction on the magnificent home in 1896. Washington Hall was a three-story white brick mansion with forty-four rooms. In its heyday Washington Hall was one of the showplaces in the South, where some of the crowned heads of Europe had been entertained. 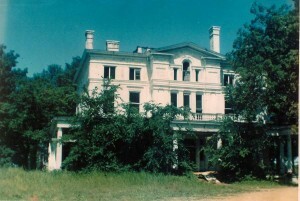 In 1965 the Washington Hall mansion burned to the ground. The grand entrance gate is the only remnant of its former glory. The entire Court Order book collection of the Southampton County, Virginia Court from 1749 through the early 1880s has been digitalized. This includes 57,000 pages, involving approximately one million names. This information is free online at: www.wiki.familysearch.org/en/Southampton_County,_Virginia. 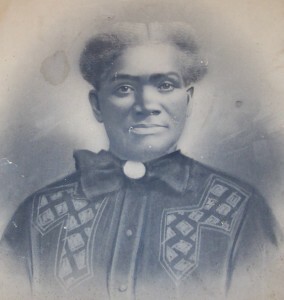 This collection is a goldmine for African Americans tracing their ancestors who once lived in Southampton County. Many of the books that have been digitized were 300 to 700 pages. Court Order books from the 1700s to the end of the slave trade lists the names of Africans when they were first brought to the area, their ages, owner’s names, and in a few cases the ships on which they were brought over. Wills and estate settlements lists the names of slaves, descriptions and family relationships. If your ancestors came from Southampton County, Virginia, you must check out this collection. Thanks go to Southampton Circuit Court Clerk, Richard Francis, and the volunteers of the Brantley Association of America who undertook this huge project in 2009 and 2010. Based on the 2000 U. S. census, Washington is the most prominent surname among African Americans. 90% of 163,036 individuals with the Washington surname are African Americans, a far greater percentage than any other name. The descendants of African Americans once enslaved on Wessyngton Plantation are part of this group. Before and after Emancipation, they chose to use the Washington surname—the surname of the slaveholding Washington family (were distant cousins of the president). At the onset of the Civil War there were nearly 300 African Americans on Wessyngton Plantation. In 1870, 212 former slaves and their descendants from Wessyngton in Robertson County carried the Washington surname. This was nearly 5% of the total number of African Americans in the county. In the years following the Civil War hundreds of Washingtons from Robertson County migrated out of the area. Today there are still African Americans in the area who carry the Washington surname (although far fewer than decades earlier), and some African American Washingtons throughout the country are descended from the Wessyngton Washingtons. Elijah Smyth or Smith was originally owned by Joseph L. D. Smith on his plantation in Florence, Alabama. When Joseph Smith died in 1837, Elijah was inherited by Smith’s minor daughter Jane, who later married George Augustine Washington of Wessyngton Plantation. 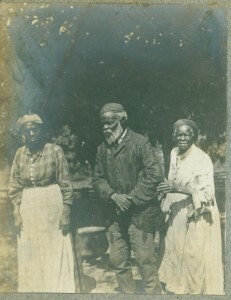 Between 1850 and 1860, Elijah Smyth made his escape from slavery in Alabama most likely using the Underground Railroad. He made it to freedom in Buxton, Canada. Buxton, was established in 1849 by the abolitionist Reverend William King, and was one of four settlements in Canada which offered refuge for fugitive slaves. Buxton was located between Lake Erie and the Great Western railway, and consisted of approximately 9,000 acres of land. The logging industry provided an income for most of its residents. Reverend King had strict guidelines for the settlers: land could not be leased, and could only be purchased by African Americans for $2.50 per acres. Once the land was purchased it had to be held for ten years. Houses had to be built that were at least 24 x 18 x 12 feet with a porch, and picket fence and flower garden in front. The town had four churches, three schools, a hotel and its own post office. In 1860, Buxton’s population was its largest with about 700 residents. Elijah Smyth was literate. Since educating slaves was forbidden by law in Alabama, he probably was educated at the Buxton school. Between 1850 and 1860, Elijah Smyth wrote a letter to Jane Smith’s aunt, Anne Pope. He sent the letter from Buxton, Canada. Will you be so kind as I do not know who my young Mrs. is married to or where she lives. The least she will take for my papers of liberty as I am ready to pay a reasonable price. It is better for her to get a half loaf than no bread. If she will take a reasonable price write to me and then I will write to you and let you know what day to have a man in Detroit with my papers and will send the money by a friend to meet him. Be so kind as to write to me in haste. In the letter Elijah Smyth offered to purchase his freedom. It is unknown why he made the offer since he was already free. He might have wanted to purchase the freedom of other family members who were still enslaved. It also is not known whether Jane Smith responded to his letter or accepted his offer.